Dole sent me samples of each of their 3 flavors -- apple, pineapple and mango -- and they are like little nuggets of sunshine. They remind me of the mochi bites in the toppings bar at YogurtLand, Pinkberry and other frozen yogurt places, just a bit nuttier and sweeter. Be forewarned, if your child is used to fruit snacks, fruit roll ups and even fruit leather, these will not taste as sweet and they can take some getting used to. But my kids have grown to love the pineapple flavor as much as I do. What a great way to wean your kids from overly sweet snacks! 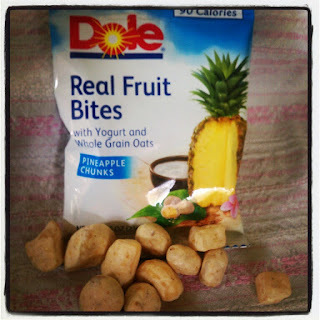 Leave a comment on this post and tell me which flavor of Dole Real Fruit Bites you would most like to try. 3) Share this giveaway (http://bit.ly/IoOemX) on your Facebook page (1 entry). This giveaway ends at 11:59PM PST on May 10, 2012; I will draw a winner at random on May 11 and post the winner's name after the winner confirms acceptance. For additional giveaway rules, click here. Good luck! I would like the mango. I think the Apple ones sound great! I would like to try the apple looks good. I Follow You On Google Friends Connect Under Barb K.
I posted on the fb page. Oh I think the Mango would be delicious! Congratulations to the winner: #92, mnsteph!